I think there's an underlying issue here which is the speed of motor vehicles and the speed differential is particularly intimidating for cyclits. It's striking that I feel most safe in Central London at rush hour where motor vehicles don't have the opportunity to build as much speed as they often do in the outer boroughs or at weekends. I think this is as much about attitudes as it is about infrastructure. It's true that the speed differential is partly a matter of perception. But, after I wrote this post, I came across a report of a (rare) Staten Island cyclist who was hit by a car at high speed on one of the roads I used. The road was one of the few with a marked cycle lane. It struck me that what happened to him could just as easily have happened to me. So I fear that there is a fair amount of genuine danger in tangling with cars at speed, as well as the perception. Well of course there is. However cycling is perceived as a far more dangerous activity than is the case in reality. Mainly I think as a result of low level intimidation by motorists (perhaps also by sensationalism among some cycling advocates). This is why I think attitudes are so important. Having wide suburban streets which allow high speeds when appropriate for the conditions is not really a problem. Motorists that continue to travel at those high speeds around vulnerable road users is the problem. You're undoubtedly right that people's risk perception is poor. It was the subject of a recent blogpost (http://invisiblevisibleman.blogspot.com/2012/11/my-ride-to-work-and-why-cars-resemble.html). It's also a key problem with risk perception that people mostly get away with risky behaviour with no immediate consequences. 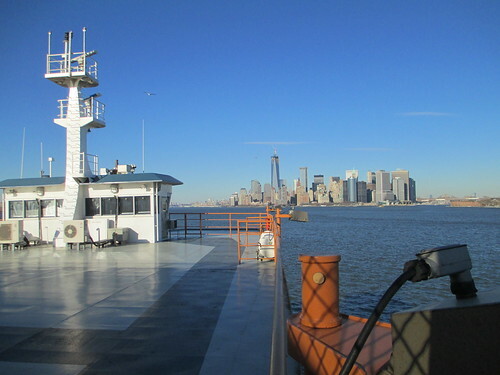 I escaped Staten Island unscathed - but it doesn't mean that, if I cycled 10,000 miles in Staten Island and 10,000 miles in Amsterdam I'd have the same chance in both of suffering a crash. I also pointed out in that blogpost about risk that cycling's health benefits far outweigh the risks. That's probably still true in Staten Island - but the risks there are still higher than in other places. Where we part company, I think, is in your contention that it's not really a problem having wide, suburban streets that allow for high speed. The evidence of Streetsblog's weekly carnage seems to me to suggest there are a disproportionate number of fatalities to pedestrians and others in Staten Island. The road layout encourages that. There are clearly places where high motor vehicle speeds are appropriate - but nearly every thoroughfare in Staten Island is currently blighted by fast-moving motor traffic and it damages both the environment (in the sense that it's just not nice to be outside) and anyone who has to be around the roads. What I'm trying to say in the post is that the issue in Staten Island isn't making it nice for cyclists. It's making it nice. Once it starts being nice, it's going to be nicer for cyclists and there might then be the numbers to start putting on pressure for cycle-specific infrastructure. But I think the urgent issue is managing the general menace of traffic and stopping it blighting such places as it currently does. Agreed. Where we share roads with vehicles speed is critical to both safety and *apparent* safety. So in builtup areas vehicles should be slowed, the 30mph at least, 20mph in reidential areas and city centres. On connecting A roads where speeds are faster than this we probably need segregation. Do this and watch cycling increase. I don't think we do actually diverge in reality. I agree with most of what you say in the blog and in your comments BTL. 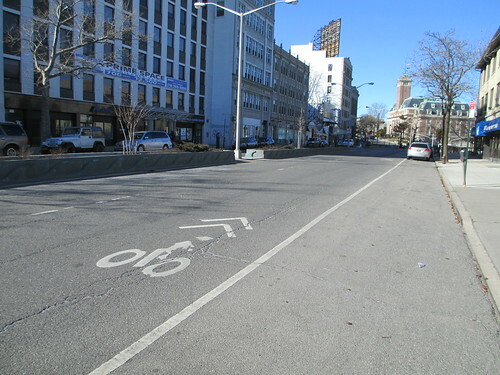 Places like Staten Island and similar in London embody the circular argument of cycling uptake. In order to improve the attitude of the general public towards cycling you need to get more people cycling. It would be great if we had loads of continental style cycling infrastructure to encourage more people to cycle, but there aren't enough cyclists to justify it in most places (in the eyes of planners). So me and you and others like us remain social outliers. I'm sure we probably don't diverge much in reality. But I must say the hairiest bits of New York City biking make me nostalgic for London. There does seem to be a general recognition in London that you shouldn't just drive straight at a cyclist. That seems less widely felt here. I think it might just be that there are still far fewer cyclists on the average New York City street than on inner London streets. It reminds me of a time I had to go to Doncaster for work and took my bike. No-one rides a bike there and it was suddenly noticeable how many more close passes and so on I was getting. Cycling is increasing even in some unlikely places, however, and I think there's going to be a gradual improvement. I am so glad to have read your post, as so many vehicular cyclists tend to flippantly tell intimidated cyclists to "just take the lane" without regard to safety. As an approaching-middle-age female commuter, my ability to "keep up" in traffic is not as honed as my college-age male cycling companions. My needs and the needs of other non-male/young populations of cyclists are not being met, which is absolutely acceptable among many cyclists. I very much understand the costs involved in separated infrastructure for cycling, however we will not see these untapped populations of cyclists until they are in place. Your 'canary in the coal mine' example not only applies to children, but also families, grandma and grandpa, non-athletes, etc. Until cycling is a method of transportation for everyone, we are not going to increase cycling numbers in the US with any haste. Thank you so much for your comment, Spokefolk. It's depressing when one sees only fit young men out cycling. It's also a pity when it appeals only to risk-taking personalities. A lot of the New York City cyclists I meet at present seem to have a greater readiness than most people to take chances with their own safety. I have previously tended towards the view that bikes and other traffic needed to share the road (the view I articulated here: http://invisiblevisibleman.blogspot.com/2012/03/in-which-our-hero-picks-up-cycling.html). But that view was absolutely predicated on the idea that cars needed to be calmed to make the roads safe for all. I think that's a vital first step in getting cycling going in places like Staten Island. It's an all-round good - it would cut the death toll for pedestrians and motorists, as well as encouraging cycling. 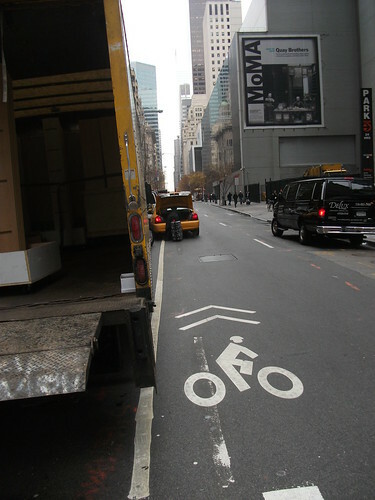 But my view about segregation was formed in London, where roads are narrower and there seems to be a greater recognition that cyclists are allowed on the roads than there is in New York. 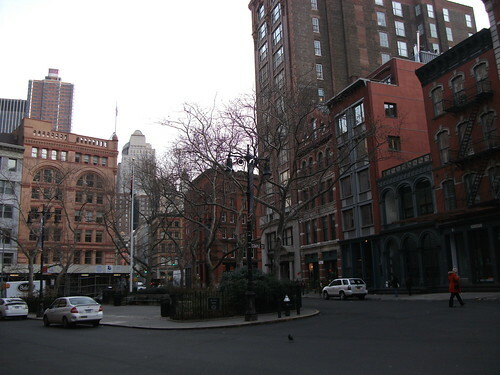 The wide avenues and parkways that cut across a lot of New York City are a different matter. A lot of other US cities have something similar. I think there should be traffic calming on these streets, to make life safer for everyone. But you're right that, until there are segregated facilities on far more of these streets, there won't be as many older people and women as ideally one might like to see cycling. Coincidentally, your post spotlighting Staten Island appeared the same day that some 50 cyclists memorialized the life and work of the late Steve Faust, son of Brooklyn and lifelong cyclist and cycling advocate, with a ride to Brooklyn shore areas in the shadow of the Verrazano-Narrows Bridge. Winning bike access to the VNB was a big part of Steve's lifelong dream and work. It's not a stretch to posit that the ability to ride across the Verrazano could be a catalyst toward enhanced bicycle respect, use and provision on Staten Island. You would have been heartened by the commitments voiced by many ride participants (and speakers during the commemorative picnic) to carry on and redouble Steve's efforts and finally induce the NY State legislature to require the MTA to design and construct twin biking and walking lanes on the bridge. I read about Steve's death and, more importantly, his life and it sounds like he was a very fine man. I would have attended the ride but I'm otherwise occupied on a Sunday morning attending divine worship. I'd love to see a cycle path across the Verrazano-Narrows Bridge, not least because it would be such a magnificent retrospective one-in-the-eye for Robert Moses, who stopped its having pedestrian and bike walkways. I rode down to Coney Island the day nine days ago now past the bridge and would have loved to have crossed it. I accidentally sent out this link with my regular email alerting people to my publishing a new post precisely because I linked to this piece in that post where I described how riding on Cropsey Avenue in Coney Island was as bad as riding on Staten Island.